Welcome to our recipe page! We've compiled a list of tried and true recipes that use biodiesel glycerin (BDG) as part or all of the soap recipe. Here you will find soap recipes that use biodiesel glycerin as a whole oil ingredient or as a glycerin additive. Included in our recipe sections are biodiesel glycerin soap recipes that will add hardness and lather to your biodiesel glyceirn bar soap. You will also find biodiesel glycerin soap recipes that will add lather and viscosity to your liquid soaps. These recipes will have the amout of lye for the biodiesel glycerin split out. This is because the SAP value for biodiesel glycerin can vary. Be sure to work out a SAP value specific to your glycerin when using these recipes. If you don't know how to work out a SAP value for your biodiesel glycerin be sure to check out our book -- Making Biodiesel Glycerin Soap. If you have never made soap using biodiesel glycerin follow the videos or tutorials recommended for the recipe you have selected. If you have any recipe suggestions, requests or any other soap idea that you would like to use biodiesel glycerin with please let us know! So with that, check out what we have so far! 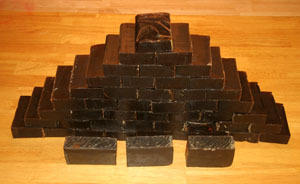 You're just going to love what biodiesel glycerin can do for your soap!